This is a warning for those of you with new foxes. A lot of you brought home a fox this spring, and are by now head-over-heels in love with your affectionate little ball of fur. He or she is clever, inquisitive, lovable, and all the things you had hoped for. Perhaps you still have a bit of a problem with food aggression, or using the litter box, but overall things are moving forward at a good clip and you're feeling confident. There's good news and bad news. The good news is, yes, you are doing well and your fox is shaping up to be a fine animal. The bad news is, the October Crazies will soon be upon us. During a kit's first fall (Usually in October, but it can be as early as August or as late as November), they go through a series of temperament changes. These changes are temporary, but very dramatic. The kit becomes aggressive, fearful, hyperactive, destructive, nippy, and prone to frustrated tantrums. It will seem as if you have lost all progress with them, but it's important to remember that this is a temporary phase. You may feel like you've done something horribly wrong in raising your kit, or be worried that there is something terribly wrong with them, or think that you're not cut out to keep a fox. Don't worry, this is a normal part of your kits development, and it only happens the first year. So what causes the Crazies? In the wild, this is the time that your kit would be driven away by it's parents to fend for itself. Other foxes, meanwhile, have no desire to let these young intruders into their territory, so they attack and drive off the newcomers. The kits have to struggle to establish their own territory and fend for themselves. Their hormones kick into high gear, so at the same time they're fighting to carve out a place in the world, they're dealing with internal chemistry they've never had before. The fear and aggression you see in your pet is a remnant of this--as their surrogate "parent", they are concerned that you are going to attack them and drive them away. The key to surviving the October Crazies is to stay consistent with your training, be patient, and above all remember that this is only a phase. By the time your kit reaches one year of age (usually considerably earlier. Gizmo was back to normal by mid November), they will have settled back into being a reasonable animal again. The hormonal effects die down as the fox gets more used to them, and they start to realize that you're not going to bite them and chase them away. It'll be hard to believe that the temperamental monster you had in October is the sweet pet you have curled up in your lap in January. So in other words, they become teenagers? does this occur in all species or just reds??? I have only ever kept reds, so I can't speak of other species from personal experience, but from what I've heard it happens in just about every species. I've also heard anecdotal evidence that males go through it worse than females do. Yeah that would make sense since they are more territorial, but I think my dogs the most territorial female in town, she own the neighborhood and will often snap at people walking their dogs even just a few houses away from ours. A fox is a wild animal and should not be kept as a pet EVER. Let it go to be the animal it was born to be.--And i dearly love them and have them living on my farm. i agree, kinda, with u. you shouldn't take them from the wild, but domesticated foxes r ok. I <3 silvers! "Letting him go" would be condemning him to a slow death of starvation. No animal-lover would ever condemn a captive-born animal to such a cruel fate. I think foxes are great but why on earth would anyone want one as a pet? Get a dog instead! Mine was hand raised, and conceived, and born in captivity. They LOVE playing with each other, and my 7-8 year old sisters. They get their soaked food every day (just 5 weeks) and they get attention, outdoor time, and dependable sources of life. They get so exited when they see me put up their play pen so they can play together. Foxes also live much longer in captivity, and usually lead healthier lives free from rabies, and other diseases. If you don't own a fox, chances are you really don't know the truth about how happy they are if well cared for! This is my baby red, and the first day I got him he immediately warmed up to me and was playing with me, playing with toys, and he was aware he was in a permanent loving home.https://fbcdn-sphotos-h-a.akamaihd.net/hphotos-ak-prn1/v/945098_567430843279547_320411132_n.jpg?oh=f0be68825637915a8ef8af67b17cacc7&oe=5189AD82&__gda__=1368003699_d6061a0902db82d53fae9e662e1bae63 It's not cruel, of course it would be if the animal was taken from the wild though. Hey Anon, try actually reading the blog and you'd see. Also, iirc Rags has a dog. And cats. And a whole lot of other critters, too. Seriously, though? Anyone who says she should just dump Gizmo in the wild to starve is a scumbag. To whomever posted that they should be "let go", is that what you do with your childs puppy after they get tired of it too? It is because of people like YOU that animals that have been domesticated end up at a painful death because you think "letting them go" is the answer. Remember all the citters on your farm trace back to a wild subject, but I highly doubt your stock could make it very long if some passerby just came and opended up your gates because they thought such animals shouldn't be "pets". Good luck with that mindset. allow me to say that all anomals were wild at one point. horses, cats, dogs, goldfish! and all of these 'dosesticated animals were once wild and people back then probably were negitive about trying to domesticate cats or horses. this is only the start of a new line of domesticated pets. 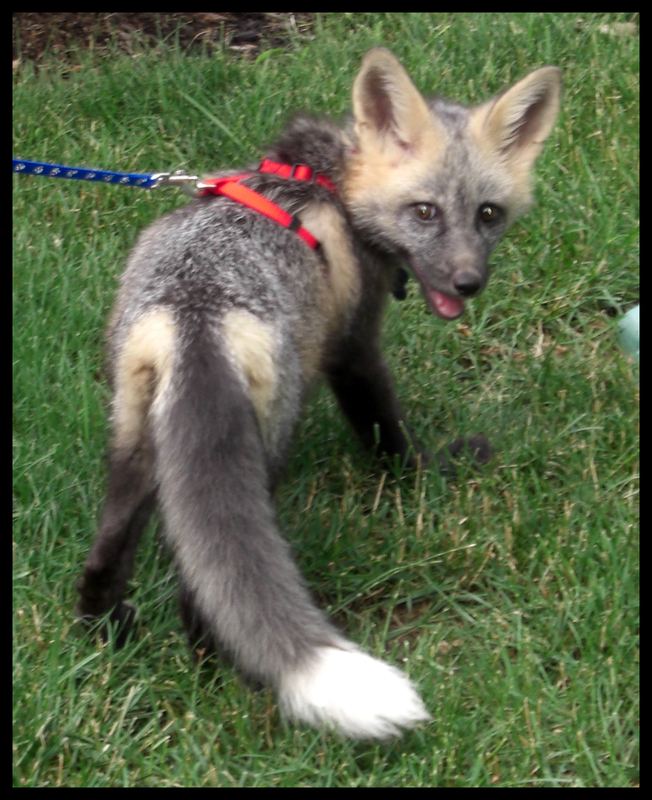 in 100 years or less, 'pet foxes' might just be as common as besenji dogs. which are not as common as golden retreivers, but are still veiwed as a completely demesticated canine. And eveyrone please remember, education is the key. also, please forgive my typos, im only eighteen. anyways, thank you for writing these blogs, they are very helpful. You see im going into animal behaviorism and hope to one day own either a wolf hybrid or fox, or both. i already own an exotic pet (leopard gecko imported) and a rottweiler and i understand i have a good many more years of research to do and hopefully some volenteering opertunities. But your blogs are no-nonsence, easy to read and follow, and very informative. and remember everyone! Education is the key. and keeping an open mind never hurt anyone either. If you are 18 you are definately old enough to know how to spell and use appropriate punctuation. And if you are smug enough to make sweeping judgements about spelling, then you should know that "definitely" does not have an "a". Removed Kaitlyn's comment as it included her location. Please remember to never give away personal information (phone numbers, addresses, etc) on the internet. Especially if you're a minor. Aren't you the chick who was talking on that other post about dumping your own 6-mo-old fox at a shelter? Don't lecture the rest of us, who keep our foxes responsibly, because you would rather just abandon it at a reserve instead of getting through the adolescent stage to when it settles into it's normal, adult behavior. There appears to be a lot of confusion about domesticated foxes. 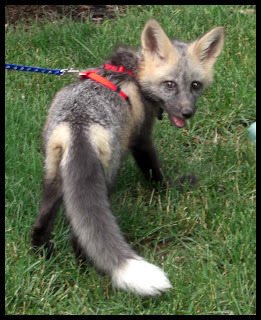 Wild foxes can be tamed when taken as kits, but these are not domesticated foxes, they are just tamed foxes. Like elephants, they can be tamed, but they are and always will be wild animals. BUT domesticated foxes, a breed of foxes developed in Russia are just that, domesticated. They are not just tamed wild animals and like cows or dogs, they wouldn't survive very long in the wild. So when we're talking about pet foxes, let's be careful to distinguish between wild foxes (BTW, all red foxes are wild)that have been tamed and domestic foxes, a specific breed of fox. The foxes in the pet trade are *partially* domesticated. Not as domesticated as the Belyaev Silvers for sure, but they are the descendants of pet stock which is generally descended from fur-farm stock which has been in captivity for many generations and is therefore quite a bit more domesticated than a "kit pulled from the wild". Domestication isn't a "Yes or no" thing; it exists on a continuum. While a red fox purchased from a breeder in America certainly isn't as domestic as a pet poodle, it is also a far cry from a "Wild" red fox that was born and bred out in nature. Your statement about "All red foxes are wild" is also false, as silver foxes are just a color phase of red foxes--therefore the Russian silvers are red foxes, and they are just as domesticated as any dog. Removed Kaitlyn's comment due to it containing incorrect information about Belyaev silver foxes. Loving the blog so far, it feels good getting some solid information about keeping foxes as well as the general stuff. Im thinking of getting one myself in a few years when I have the cash to support such a cool animal. The being stinky thing is veering me away from the idea though. Can someone compare it to something for me? How bad can it really be? They smell like a skunk. Seriously. We have a red (spayed) and an arctic (neutered) and people think we had a skunk spray our house. Wow! What an eye opener. I had been thinking about adopting a fox. I am NOT a good candidate for this! I have two dogs and they are plenty of work! Thanks for the blog and all who comment. You do help people like me make an informed decision. I hope others will take into account that the owners are the ones who make it work. Wanting something is not enough of a reason to get it! I've already posted my question on another topic but, OMG it must be HORRIBLE in Fennecs. They're hyperactive even as far as foxes go. And if that video about Scout is any indication, they're prone to throw tantrums even when they're in a good mood. I stumbled upon this blog because while I have seen foxes in my life (running across the street or into the woods near my house) I've never actaully HEARD one. I'm 24, with 2 cats, one dog, and my boyfriend and I are thinking of taking in another male kitty. Off and on over the last few days I've been hearing strange noises outside. Day, night... doesn't matter. Today, after googling my fingers off, I discovered it was the cry of a fox. Not one hour later, I finally got a good look at it. He/She was standing just outside my chainlink fence, hissing at my pitt/mastiff mix Luna. Luna started barking, I called my BF to look as I ran from the bathroom window to the back door. He/She was gorgeous and appeared to be some kind of mix with the red/gray as those are the most common wild foxes in my area. I've always loved foxes, probably because of Disney's The Fox and the Hound, which is very sad, but also my favorite Disney movie. Since then I jokingly have said if I knew where the den was, and if something happened to mamma/daddy, I would grab up the litter and raise them myself. I doubt this will happen, but I've definitely been surprised to find there are domesticated foxes and breeders who allow you to adopt them! I told my BF I want two, and he gave me the crazy eyes... I told him not to breed, just to love, and it would probably be at a point in my life where I have no other pets so they can get all of my attention... well, maybe I'll have a dog around that time, but only the one. I'm going to start saving immediately, and hopefully be able to have my foxes within the next 10-15 years. Thanks so much for this blog! Here I thought I was strange for loving foxes as a lot of people in my area give them the same opinion they give opossums! I recently came across your blog through a series of very fortunate article links this morning. I am amazed that you can actually have a domestic fox, and that there are people out there dedicated to ensuring that people who raise them have the knowledge and information available to them through your website. Thank you for the blog, and for sharing your experience. Why are there always "pro-wild" individuals that lurk upon blogs such as this? We can respect your views by simply not going onto your places of interest and offering an unwelcomed comment that disrupts the individuals of the community they choose an interest in. This is a blog that is titled "The Pet Fox". This is a blog for those of us who enjoy educating ourselves and not allowing ignorance to get the best of us. To be open minded and to possibly accept the fact that there ARE other ways of doing things regarding animal welfare, relationships and simply discovering a different dimension between humans and animals is possible, then let it be. If you choose to remain unhappy, keep it to yourself and stay away from such blogs. Why is that so incredibly difficult? Thats like being vegan and being a number one suscriber to slaughter house websites. Why on earth make yourself so miserable? Why on earth cant people just be content that others have different passions than others? Its no different to be a bigot. Whether its a race, sexuality, religion, creed, anything else that we actually have a CHOICE, someone always has to come in with their unwelcome, usually UNEDUCATED, ignorant rant about whatever it is they are against. Go to your PETA site and remain happy with others who have the same views as yourself. I have a silver fox that has been on my property for at least a month. I have been giving it leftover meat from our meals. I then had the brilliant thought of "why not dog food". I found this site after googling my question and was so relieved to hear that it is fine to give it the recommended ingredients of some dog food. I really appreciate this site. Thank you.